Located on the highlands not too far from Arashiyama Station is a special place in Japan where creatures welcome curious visitors: Iwatayama Monkey Park. Here you can find wild Japanese macaque monkeys—which are often seen on popular travel guides and brochures taking a restful dip in onsen during winter. At Iwatayama you can see them fully active, running and swinging around the park. Open from 9:00 a.m. until 4:30 p.m. during the summer season and until 4:00 pm during the winter season, Iwatayama costs 550 yen enter and offers its guests a wild experience. The winding path, made of both concrete stairs and natural pathways, is steep. When you visit, makes sure to bring comfortable hiking shoes. Toward to beginning of your hike, there is map that show you the path to the monkey park. While walking uphill, the natural surroundings are lush and green. During autumn, Iwatayama offers beautiful autumn colors scenery. Proceeding up the mountain, there are signs that indicate when you are entering the areas where monkeys can be found, as well as a few warning signs. 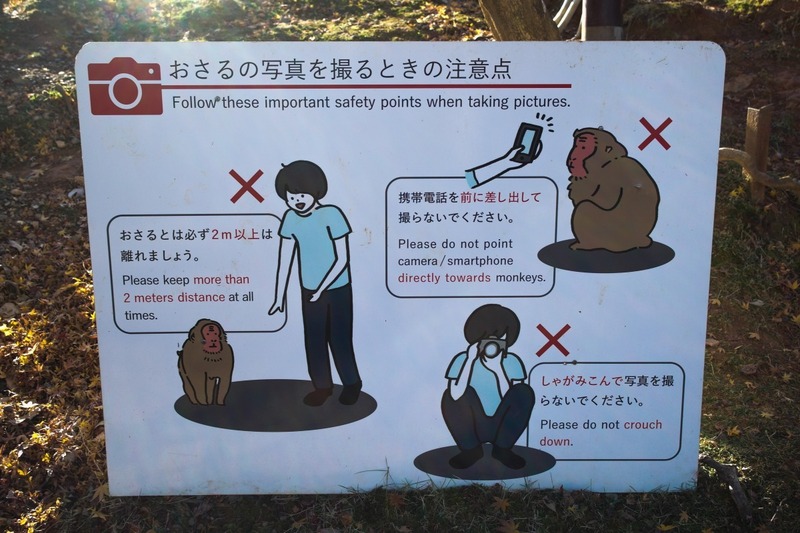 The macaques, although looked after by humans, are still wild, so there are rules to follow for a safe journey to Iwatayama. - Don’t stare the monkeys in the eye nor touch them. - Don’t feed them outdoors. - Don’t take close-up pictures of the monkeys—stay at least two meters away. - Don’t crouch while taking pictures. At the summit, staff welcomes you with “otsukaresama desu,” which in this case means “Good job, you made it to the top.” This marks the end of your hike. Here, you can find a resting area which allows you to sit and relax on benches. 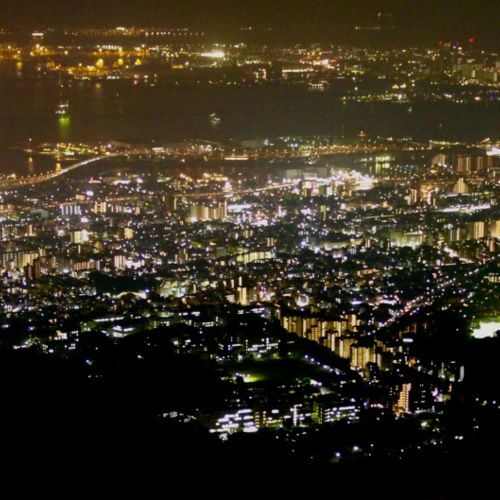 There is also a stunning view of the surrounding city of Kyoto. At the top, the monkeys are densely packed and at the center of the summit lies an enclosed resting area where visitors are able to buy snacks such as peanuts, bananas, and different types of diced fruit. Although delicious for humans, they are used to feed the fury little creatures that reside there. Coming to Iwatayama, visitors can expect to experience a variety of emotions: surprise and excitement at seeing animals in their natural habitat and feelings of joy in response to seeing baby monkeys running and hanging around. 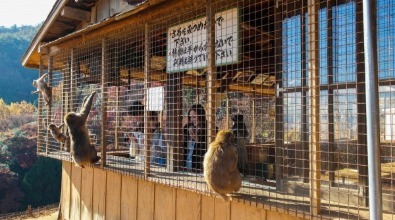 The Iwatayama Monkey Park is a great place for groups of friends, families, and humans of all ages. 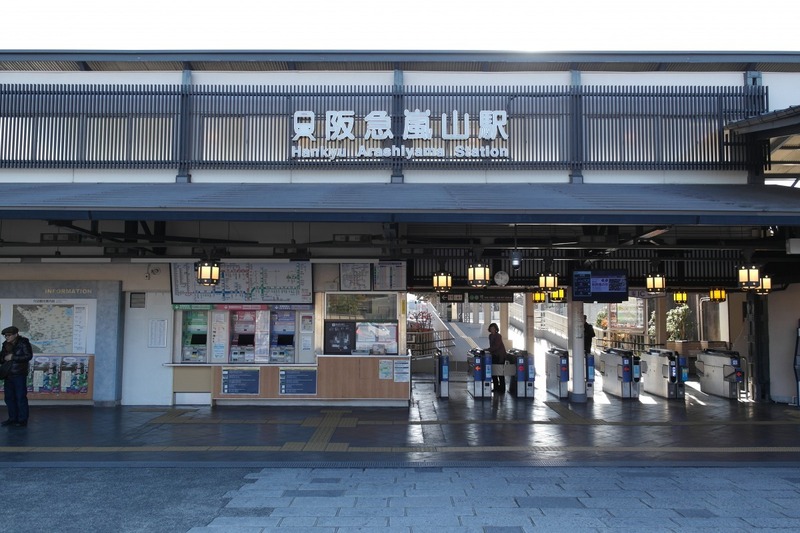 The Iwatayama Monkey Park can be accessed by the Kyo-Train, operated by Hankyu Railway and covered by the HANKYU TOURIST PASS. Infused with tastes of Western and Japanese style, it is designed with an elegant touch. This train in particular is special as there are no hanging advertisements and distractions, allowing its passengers to fully immerse themselves in a classic Kyoto atmosphere. On Saturdays, Sundays, and public holidays, the Kyo-Train will take you directly to enjoy the sites and experiences of Arashiyama, Kawaramachi, and Karasuma. 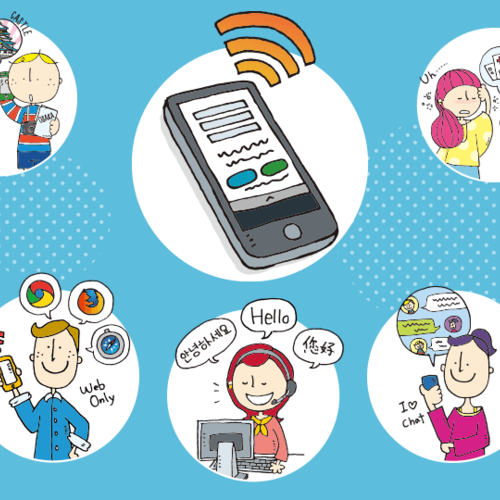 From front to end, there are many features that make the Kyo-Train train quite special. Cars one and two inspire images of blooming orchids; cars three and four offer a nostalgic feeling of a classic Kyoto town house with wooden booths and tatami backrests; cars five and six offer a relaxing atmosphere of green hemp leaves. There is also a hanging scroll-like decor.